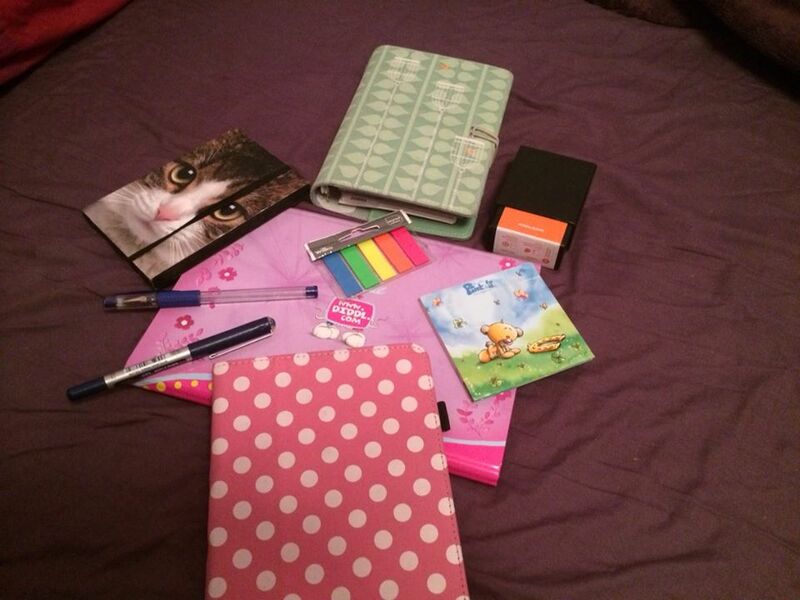 Beautyqueenuk | A UK Beauty and Lifestyle Blog: Blog V Working Full time - how I stay organised! Blog V Working Full time - how I stay organised! I often get asked by fellow bloggers how I manage to run my blog, post most days and work full time. As a blogger you all know how much hard work it is, it isn't simply a case of going to Boots, buying three items and writing about them, for me it is a case of getting the product, writing some initial thoughts no matter how trivial they might be, using the product for a few weeks and then having taken photos, I write some more notes before constructing my final masterpiece and yes I work full time, I am a wife and mummy to three cats, not to mention a tank full of fish, so how do I do it? For me the key is not just to be organised, it is being really really organised and these are my tips. I always have a notebook with me, whether it is on my bedside table, in my handbag or on my desk, I always ensure one is close to hand. I am a huge fan of stationary anyway and love pretty notebooks, so this also helps with that addiction. However, having something and somewhere to write down those thoughts, ideas, notes and pieces of information you might need or find useful at a later stage is something I find super handy. I also find having a notebook handy when I go to events, product launches and meeting other bloggers, you absorb so much information that you sometimes just need to write things down, either there and then or on the way home when things bounce in and out of your head. For me having a notebook or five is one way of keeping myself organised as well as a Filofax that I use for invitations and event notifications. I hold my hands up and admit that I am a list writer, I always have a to-do list whether it is in my filofax, on a post-it note, a document at work on my computer or in one of my many notebooks, I have a list and I use it. My to-do lists aren't in any particular order, like my notes they are things that pop into my head and I add them onto my list and as I work my way through that ever-growing list. I also have a list of products that I am reviewing whether I have bought them or they have come from a pr company, it serves as a timetable land a reminder all in one. As I work my way through those lists I feel a sense of achievement as it gets smaller and more things are crossed out. Like notebooks, for me lists are another way of staying organised, it is is rare I forget to do something, though I am not perfect and writing lists is something that really works for me. Do you have those days when you just want to sit there and write posts, one after another? Make the most of them and do it, where you can. I often find that if I am in the mood to write, then I can create numerous blog posts with minimal effort and it is less of a strain throughout the week. At any one time I have between 10-20 draft posts, admittedly not all of them are complete, but at the top of those draft posts I will have a to-do list to finalise the post before it goes live, such as taking photos, sorting my labels out, adding my links in and so on. In doing thing this way, I find running my blog much simpler and easy to do, even of that draft post only consists of a few lines, paragraphs or even thoughts to help me write it. I have admitted in many posts that this is perhaps on of my main weaknesses but I am taking steps to improve. However, if there is a glimpse of that yellow ball in the sky known as the sun and you have time to take photos, take as many as you can at once and upload them to your computer so that you have a natch of photos you can use when the time comes to writing that post. I often take quite a lot of photos that I haven't got round to blogging about yet and that serves as a reminder to get on with it. I know some people have a real issue with this, but I don't. If you have a really busy week, try and schedule one or two posts during that week to keep things moving and relieve some of that pressure. I often schedule one or two posts a week and set reminders in my diary to tweet about them and add them to a few of the Facebook Groups that I am a member of. The same can be said of tweets, you can use applications such a Hootsuite to schedule some of your tweets to give yourself a bit of breathing space. Like most bloggers, I get a lot of emails flying into my inbox and I don't always have the time to sit and read them as soon as they arrive. I use Gmail for my emails and I have a lot of folders set up to drop emails into once I have read them, even if I haven't replied yet. So some of my folders are for PR Contacts, I have one for each brand I have worked with or am working with and within this folder are any updates to products, I also have information on product launches I am going to or have been too because they might contain some information I need when it comes to writing a post and so on. The other thing I also do is that if I am going to be away for a day or so, I have an 'Out of office' message set up to let those who are emailing me know why they have not got a response. I tend to reply to emails within 24 hours because I think it is polite to do so, but if for any reason I am unable to do that, I would like the sender of the email to know. Then once I have done those small tasks, I might decide that because the weather has been really nice that I will take photos of some of the products I have waiting to be reviewed, then I have them ready for the posts and don't have to rush about doing them later in the week. Anything is achievable if it's cut down into a smaller size. Rather than feeling like you have to write tetake photos, reply to emails and schedule your social media content all at once, cut down each task into smaller section and move onto the next when it's complete. Finding somewhere to sit and write is really important. For me whether I am writing a penpal letter or a blog post, it has to be done somewhere I am comfortable, can access all the things I need easily - plug sockets, USB, Camera, Phone and so on. Sometimes that place is in the lounge in front of the TV (which isn't always on), sometimes it is sat in bed and other times I can be on my iPad on the tube writing a post. I know others think having an office and/or desk is the place to blog from, but for me it is more about comfort than anything else. It is really lovely when you have an inbox full of offers from companies and PR people offering you things to review, it is such an honour to be asked. But, don't always feel you have to say yes. If the product you are being offered doesn't fit within the theme of your blog or it is something you would never use and don't like the sound of, never feel duty bound to say yes, simply reply to the email and honestly tell them. Don't be afraid they will never contact you again, you are more likely to be respected for your honesty. Whilst I am yet to have a brand directory live on my blog, it is a working progress, I do have one notebook dedicated to the products that I receive from companies and PR people. Within that book I write down what it is, who it has come from, the date I got it, whether or not I have taken photographs of it. Then when the post goes live I put a tick next to it. This helps me remember what I have and haven't written about, posted and/or photographed and I find it less stressful to remember every minute detail. Naturally it is not easy working full time, running a job, being a wife and blogging but it can be managed and most importantly it can be enjoyable and less of a chore. Do you have any other top tips on how to keep yourself super organised? This has really helped me, I guess its a hell of a lot easier if you are organised. At the start I wasn't as much, but like you I find writing lists and making notes make things seem less hectic! Great post love the sound of the product directory and what you do. Great post Rachel! We operate very very similarly lol! What a great post hun! I had a little blogging break due to personal reasons but i'm jumping back into it and definitely always have a note pad to hand, and I couldn't agree more with the 'blogging days' makes things much easier while your in work. I always say that im going to start a notebook on things im going to post about but when it comes round to it i dont bother or end up going right off track!